Press Photo by Marty Umans from Willems’ website. Ah, picture books. Where have you been the past few decades of my life? Whyyy did I ever stop reading you? I always knew my “acquire picture book expertise asap or else” professional development project was going to be a pleasure rather than a chore, but all the same I’m amazed by and delighted with all the gems I’ve been finding. 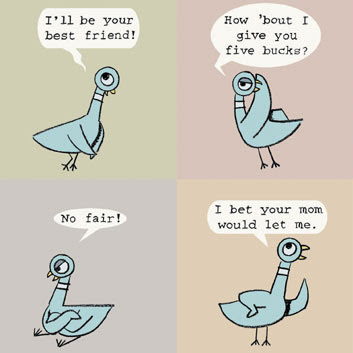 So here I am, the better part of a decade behind the rest of the world, discovering the absolute wonder that is Mo Willems. I’ve spent the past few months reading every book of his I could get my eager little hands on, and today I want to tell you about some of my favourites. 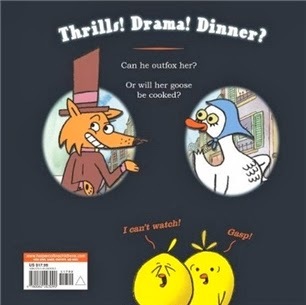 The book is narrated by a group of goslings who, Greek choir-like, appear to comment on a mother goose’s decision to go for a walk with a cunning-looking fox. Of course, this wouldn’t be a Mo Willems book if the story were a predictable cautionary tale, so the outcome is not what you might expect. Willems’ subversion of the damsel in distress trope is partially comedic, but the humour is never at the goose’s expense, and it just makes me so happy to know there are smart, funny children’s stories out there where a female animal is portrayed as competent, clever, and a force to be reckoned with. Hooray for subverting expectations with style and wit! Much like the above, the Pigeon series (which began with 2003’s Don’t Let the Pigeon Drive the Bus!) is a triumph of humour, voice, and expressive illustrations. 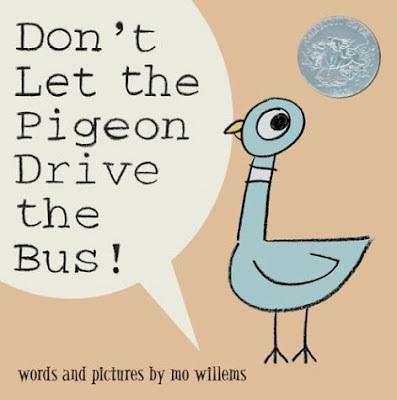 The series is about an argumentative pigeon who tries to persuade the reader to let it carry on with what it’s clearly an ill-advised plan (be it drive the bus or stay up too late), or demands to get something someone else in the vicinity got (like a cookie or a hot dog). This really doesn’t do the series justice, though, because it’s all about the tone of the books and how absolutely perfect it is. These are books that invite participation and happily demolish the fourth wall, but in a way that never undermines the pleasure of being told a story. The Elephant & Piggie series is similar in its use of humour and metafictional elements, but the tone is gentler, and it actually makes moving points about the delicate give-and-take of friendship quite frequently. These books are funny and smart, and they combine accessible language with real emotional resonance and delightfully expressive illustrations. I wanted to focus on Internet favourite We Are in a Book! — I’ve seen it on my tumblr dashboard dozens of times (sometimes without attribution – oh tumblr, I love you, but why must you strip credits in reblogs? Hooray for libraries that set things straight) and I can see why it would appeal to anyone who loves stories. 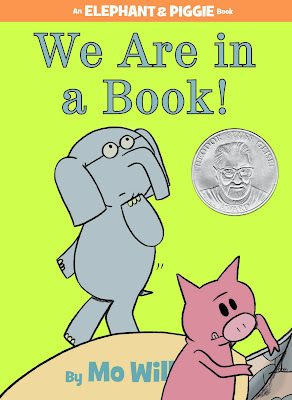 In We Are in a Book!, Gerald the Elephant and his BFF Piggie have a bit of an existential crisis when they realise their own fictional nature — and furthermore, that their story, like all stories, will inevitably come to an end. People more articulate than me have written at length about the metaphorical resonances of this book, so I’ll just point you towards their pieces. I read the ending differently than Plotz, though — the plea to go back go the beginning breaks the neat parallel between art and life, but it makes a truthful point about our relationship with fiction nonetheless. Additionally, the prospect of returning to our favourite fictional worlds as many times as we like can be a source of comfort in the face of transience. The other thing these books got me thinking about is how children, even quite young ones, have a far more sophisticated relationship with stories than we tend to give them credit for. 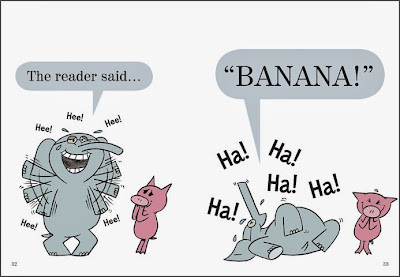 The metafictional elements in the Pigeon and in the Elephant & Piggie books work so well because their target audiences are well aware of what stories are, are developing a keen understanding of how they work, and take pleasure in watching the grammar of storytelling be made visible and played with. The best stories about stories are the ones that make us aware of the magic trick being performed without breaking the illusion, and Willems absolutely excels at this. 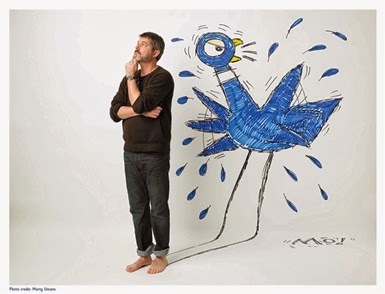 For more on Willems, there are lots of excellent posts under the Mo Willems label at MotherReader, and also at Seven Impossible Things Before Breakfast. Halfway through drafting this post I started thinking more and more about something that first occurred to me a while back, and I thought I might as well bring it up here. Possibly a post where I join the multiple voices singing the praises of a successful, award-winning children’s author like Willems is the exact right place to bring it up. It’s to do with the gender biases we almost inevitably encounter when first exploring a completely new to us field. As some of you probably know, I work for a public library system and have a particular interest in library services for children and young people. I’ve always been into children’s and YA literature and was fairly confident in these areas from the get-go, but when I started my job a little over a year ago, I knew almost nothing about literature for the very young. Naturally I wanted to remedy this, and so I began to research. It’s been an interesting process, especially because it had been a while since I started from scratch. I don’t mean this to sound arrogant — it’s just that when it comes to my main areas of interest (be it feminism, speculative fiction, graphic novels, YA, the Victorians, you name it) I have enough of a grounding that even though I’m far from knowing all there is to know, I know where to look for more. 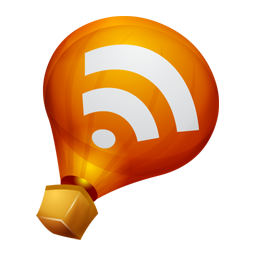 I have favourite authors, go-to bloggers, bookmarked reference books, reading lists a mile long, and enough information at my disposal that it’s fairly easy for me to go beyond the immediately obvious. So much so that I was perhaps at risk of forgetting what the immediately obvious actually looks like. Before I go any further, let me tell you a little bit about what researching picture books has been like so far. I started, as newcomers to any field often do, by looking at the winners of prestigious awards like the Caldecott and the Kate Greenaway medals. I asked for recommendations, and I paid attention to what was popular at my library. I also, literature nerd that I am, got my hands on more scholarly books about picture books and looked for the works that received the most critical attention. What happened, I soon noticed, was that I was coming across a lot of works by men. Not exclusively, of course, but predominantly enough that I noticed. And the thing I had semi-forgotten, because it’d been a while since I’d been a complete newbie, is how easy and tempting it is to simply go along with what you encounter first, because otherwise you feel completely lost. To be clear, I’m incredibly grateful to have come across Mo Willems, John Burningham, Ludwig Bemelmans, Oliver Jeffers, Jon Klassen, Leo Lionni, etc. Their work is excellent; it brought me a lot of joy and I’m more than happy to promote and celebrate it. But also, I know two things: one, that the world is not a level playing field, and that consequently I didn’t encounter these books at every turn on the grounds of their merits alone. Their ubiquitousness is partially the result of a deeply ingrained social system that grants men more authority and prestige for doing the same work as women. Two, that there are picture books out there by women that are just as good, but I’m not coming across them quite as often or as easily. This is, I repeat, a systemic problem — it’s not the fault of any individual who celebrates or promotes work by men they understandably love, like I did in the first half of this post. The problem is the pattern all those individual actions add up to, and how it consequently becomes easy for women’s works to be sidelined without us even realising it. It’s impossible for me to fail to make a connection between this experience and the conversations I’ve been following online: about power and prestige in YA, about influence in SFF, about the Waterstone’s SFF booklet that overwhelming promoted white male authors. Plus, as some of you might remember, a little while ago I raised many similar questions about gender balance in YA award winners in the past decade. This worries me. I do of course realise that I’m not at all powerless here — having spotted this trend, I can now go beyond the surface and make a point of looking for the women whose works I didn’t find as easily as those of their male counterparts. I can talk to colleagues with real expertise; I can dig deeper. To be honest, as someone whose ultimate goal is to develop professional expertise, I was never in any real danger of stopping at the first dozen names thrown my way, and I think it’s these that are more likely to be overwhelmingly male. But how many people do stop there? I think we’re all likely to when we’re casual readers just dipping our toes in, and this is what we are when it comes to so many fields. Also, how many people will not even realise that something is amiss, because we’ve been trained to perceive male dominance as a normal state of affairs? Like I said, I’m going to dig deeper, but I suspect that individual action, while a crucial step, is never the whole solution. We can do better together. We can create a world where it’s not quite so easy for the casual reader to go down the rabbit hole of male dominance; where a newcomer to a creative field won’t develop a gender-biased and distorted perception of who the absolute best are. And this is something we need to do collectively. But to start where I can, tell me: what are your favourite picture books by women? I have very little knowledge about picture books, and I'm happily following your foray into books for this age group and will probably go by your lists first. (I'm sorry if this makes me sound lazy). Reading your title I assumed that your worrying thought would be that you had read everything by Willems, but of course it is much more intelligent than that! I can recommend very little to you, but I just want to say that I think it is a big step to notice and acknowledge this bias and also made me think whether I would have noticed myself at first. So thank you for raising this point. Hopefully, I get to contribute to the list a little over time. I'm trying to go through the books I read as a child in my mind, but I think we got most of our picture books from the library and most would be Dutch so perhaps it is one of those things that are not available in translation. Will do some more thinking though! 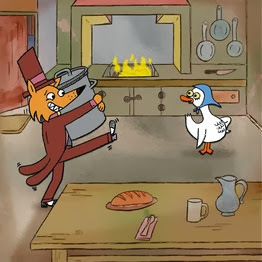 The story about the fox and the goose reminded me of the Beatrix Potter one. And now I am kind of sad to notice that perhaps Potter works exactly with the idea of the frail female animal character. But it's good to know that there are other stories out there! Mo Willems is definitely on my list (had been ever since I saw he has a title for a book "Knufflebunny" which appeals to my bunny crazy mind and the fact that Knuffel is the Dutch word for hug & soft-toy. So much to think about here - and another reminder to me to cherish the collection of picture books we have for our children, even though they are well past the supposed age for them. My favorite picture book by a woman would be Wanda Gag's Millions of Cats -- which I adored as a child and can still recite most of from memory! I also really like Shirley Hughes and Lois Ehlert (Eating the Alphabet and Planting a Rainbow, just to name two). Tasha Tudor is another classic. I'm kind of ignorant when it comes to picture books, I'm very sorry. I can suggest Kate Greenaway, but she's obviously probably a bit more dated than most readers will want, I suppose, but her books are charming. If you've never read Wanda Gag especially 'Millions of Cats' I recommend her. Margaret Wise Brown of course. Jane Yolen, she's a giant, too, but you've probably already read her. Then it gets more into early reader, but I love-love-love-love-love-love-love 'Hitty, Her First Hundred Years', and to me ti touches on so many things that might be powerful to you, personally, as well (at least I think so, I don't mean to presume). Hitty herself felt, to me like this powerful metaphor, for girls in general in the 19th century, in a very subversive way - a doll, a lower class doll at that (she's carved by hand by a peddler out of mountain-ash wood, and ends up for a long time forgotten in an antique shop amidst the much more desirable porcelain dolls), someone whose place is to lie still and accept what is given her subtly presses at the confines of her system, in search of friendship and a place in the world, and adventure (lots of that! She goes to India, and New Orleans, works with a snake charmer, Charles Dickens etc, etc, etc). And she's presented as smart, and observant and wise in a way that it is difficult for people to capture without falling into tropes - an adventure novel without the difficult-to-escape presumption that adventuring happens sword-in-hand, or with an 'evil' that must be defeated. Hitty's adventure is life itself, and all she really wants is to live, to love and be loved. The original is wonderful, but the newer one, where a chapter is added about the American civil war, and Rosemary Wells draws new illustrations for it is also gorgeous and highly recommended. Re women who write books for children, one must first of all mention Maira Kalman whose biographies are absolute musts! And she is also her own illustrator, and she is fantastic. Some other authors/books I like: Brave Girl by Michelle Markel (nonfiction about a young labor agitator), Henry’s Freedom Box by Ellen Levine (about an escape from slavery but everyone thinks of it as a Kadir Nelson book because he did the art), books by Elin Kelsey (who is a lovely illustrator and always includes multicultural images), Love Twelve Miles Long by Glenda Armand (about the unrivaled love of Frederick Douglass’s mother), Bring Me Some Apples and I’ll Make You A Pie by Robbin Gourley (about the female chef Edna Lewis). After seeing Jason's comment above, I just have to say how happy it makes me to see someone else talking about Hitty! I loved that book too, so much that my mother made me a paper doll of Hitty and making outfits for her was a major occupation of mine for many happy childhood hours. Jason, you make me think I should reread it! I loved the adventures but have never read it since I started thinking more self-consciously about women's histories and stories. I love those pigeon books; I actually get frustrated when Madison won't sit still for the whole story. I haven't read the other series yet, but I will definitely be on the lookout. 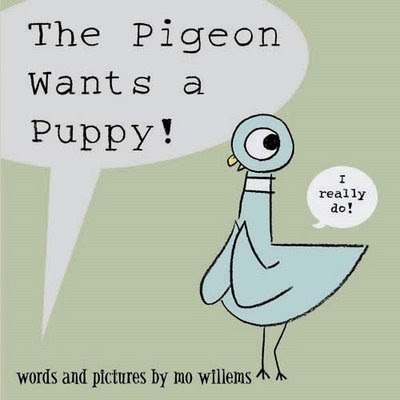 I just love Mo Willems books. I used to keep a few Elephant and Piggie books on hand each week to fill in during kindergarten story time, but I wasn't sure they would get WE ARE IN A BOOK. They sure did, though -- it was their favorite one. I'm so far out of the picture book loop these days. If I ever get a nephew or niece (fingers crossed for 2016 or so :p), I'm going to go nuts buying them awesome children's books. But for now I don't even know who the superstars are -- Mo Willems was a new name to me. A really loves the Pigeon books. But I think the favorite Willems books in this house, so far, are the Knufflebunny books. (We haven't gotten the chickie ones yet, our library doesn't have them, Sigh.) The Elephant and the Piggie ones ... We Are in a Book made me laugh out loud on first read, but I think the meta-ness of it is still a bit over A's head, unfortunately. As to books by women: Julia Donaldson's The Snail and the Whale is pretty awesome. I've wanted to read more of hers, but I haven't found them yet. Lois Lenski is a classic children's book author (although the extreme whiteness of the characters in at least the one we've absorbed so far is troubling). We also really like the Kate DiCamillo books we've read so far (although closer to early readers than straight up picture books) — Bink and Gollie is pretty fun. I don't know if you're separating out board books in your picture book quest, but a list of female authors for young children would be lacking without mention of Sandra Boynton. So great. I am loving the author/illustrator team of Julie Fogliano & Erin Stead. So far they've done and then it's spring and if you want to see a whale. Both books are intensely poetic in a real way (as opposed to another darn rhyming book), and Stead's illustrations and Fogliano's text just work perfectly together. I will sing their praises forever. I also liked Vanya Nastanlieva's The Arrival and Naoko Stoop's Red Cap Girl a lot. And Laurel Long doesn't seem to be publishing as much, but I really love her folk tale retellings. I'm also a children's services person, and my feeling is that women are getting published, but they're not the huge names and don't tend to have as big a following. And yes, I love Mo Willems and Mac Barnett and Jon Klassen and Kevin Henkes, et al, but it would be great to see more gender parity. There are Mem Fox and Marla Frazee, I suppose, but I don't think they're nearly as widely known. I've found several nice picture books from a blog called Design of the Picture Book; no idea how they break down gender-wise, but it's a good one for bringing out upcoming titles. Cynthia Rylant, Yuyi Morales, Marla Frazee, Patricia McKissack, Jacqueline Woodson, Eve Bunting, Patricia Palocco, Peggy Rathman, Barbara Brooks, Julie Fogliano,, Erin Stead, Deborah Freedman, Grace Lin, Jeannette Winter, Marie Louise Gay, Melissa Sweet, Leuyen Pham, Deborah Heiligman, Jen Bryant, Isabelle Arsenault, Lita Judge, Audrey Vernick, Joyce Sidman, Sara Varon, Lenore Look, Ame Dyckman, Emily Gravett, Jackie Briggs Martin, Allison McGhee, Marilyn Singer, Mem Fox, Melanie Watts, Jane Yolen, Molly Bang. Happy reading! Previous commenters have hit on many of my (and smallfry's) favourites, but have you gotten to Margaret Mahy's picture books yet? Bubble Trouble and Down the Back of the Chair are both superlative. Sheree Fitch is a Canadian favourite; try to get your hands on Mabel Murple, which is possibly one of the best books ever, and I am not just being hyperbolic here. In addition to being SO FUN to read out loud (link to best reading ever) Mabel is such a firecracker. All three of the above are full of rich language and fantastic rhythm and rhyme. Mahy's posthumously published The Green Bath is also great, though I don't think as good as the other two I've mentioned. Polly Dunbar is also amazing, she writes and illustrates her own books as well as doing the illustrations for some of Mahy's books and one of my favourite poetry compilations for small people, Yolen and Fusek Peters-edited Here's a Little Poem. Our current Dunbar favourite is Arthur's Dream Boat, but also watch for Dog Blue. re: Willems, smallfry loves all his books that we've read, including a number of the Elephant and Piggie books, which though they are early readers work really well as shared reading with a book-loving two-year-old too. Interesting to introduce her to different reading conventions -- the speech bubbles instead of dialogue and blocks of text. The names I thought of have mostly already been mentioned, but I haven't seen (or I missed) Rosemary Wells, who I love. Ruth Krauss is an old-school great. Trina Schart Hyman is one of the great illustrators of the last 30 years--when I was a kid she was getting started in Cricket magazine, and for a while she was everywhere. I love her stuff. What great suggestions! Trina Schart Hyman's fairy tales are especially good. To the Canadian list, I'd add Marie-Louise Gay. I don't think anyone has mentioned Julie Vivas yet--start with Possum Magic (which is a very Australian book). Peggy Rathmann, Susan Meddaugh, Barbara Lehman. Next time Rohan and I get to meet up, we will have to share our love of Hitty and Shirley Hughes. 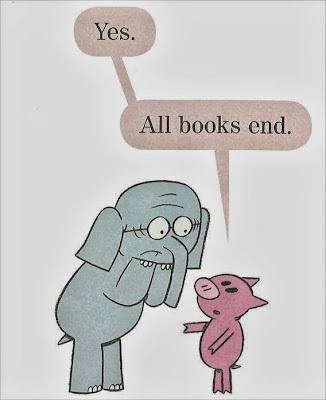 I love Mo Willems! I never considered picture books to be more than books for young kids, until I was working at a bookstore, surrounded by ladies who loved picture books. Hence, I discovered people like Willems, and, a favourite, Jeffers. But i couldn't agree more with you. I racked my brain while reading for some female picture book authors - all I could come up with, really, was Judith Kerr who wrote the classic The Tiger Who Came To Tea. Obviously, that's just of the books recommended to me, and that I can remember right now but it's embarrassing nonetheless. Also embarrassing is that Waterstone's display. I used to run the sci fi & fantasy section of my store when it came out, and it was such a pity, when I had been working hard to promote female in sff. It's the lack of thinking like this that goes on to lead to a bigger problem, and something that really must be tackled. Thanks for some food for thought, i really hadn't thought much about picture books in that context before. My favorite picture book author is Eve Bunting...when I met her at ALA midwinter a few years ago, I totally fangirled lol. But she isn't like Willems in that she does the illustrations as well, only the writing. hmmmm maybe Jan Brett? The picture books that help save some of my sanity when my children were infants were by Sandra Boynton. My favorite was Moo, Baa, La,la,la. Ron's favorite was But Not the Hippopotamos. And everybody liked Philadelphia Chickens when it came out with a CD of music we could play in the car. Loads of greats have been mentioned already. A few of my (and my children's) favourite female picture book authors that haven't been mentioned yet include Barbara Cooney, Virginia Lee Burton, Margaret Hodges and Jill Barklem. Love these books. My youngest (nearly 3) has just discovered the Elephant & Piggie ones and is enthralled. My older kid likes them too- she pretends not to be interested in picture books anymore but whenever I bring home a Mo Willems from the library, she sneaks in a read! 3 female authors that my niece (8 now & becoming quite fluent but still prefers picture books & picture chapter books to 'regular' chapter books, although she's start reading those too) loves are Jackie French, Jan Brett, and E.S. Redmond. All white, although I make sure she reads POC authors as well, those are the ones that she wants to read over and over again right now. She also loves anything to do with horses, which tends to be a female-dominated realm (both authors & characters).